As amazing as that is and as excited as I am for it, what I'm most blown away by is this tweet from Elon. 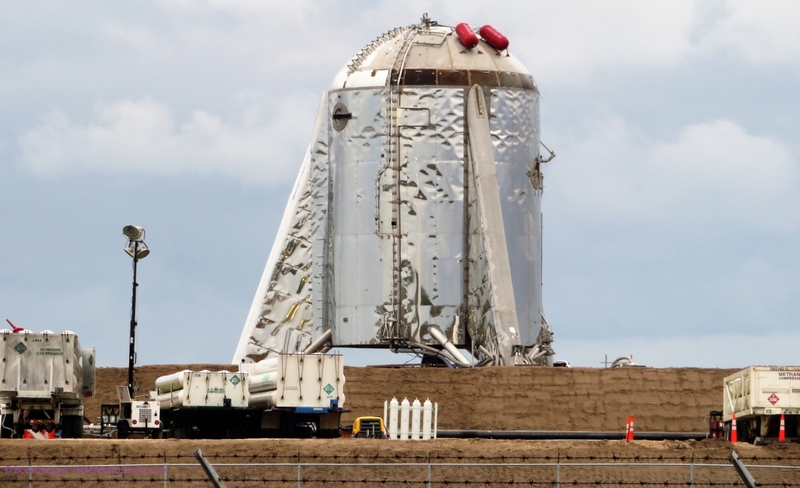 They're building a full-blown orbital spacecraft in an open field in Texas! Well, obviously most of the FOD-sensitive work is done indoors, but for sure, the agility & speed of SpaceX's construction prowess is certainly amazing. Absolutely, the engines and computers/sensors are definitely assembled indoors, but can you imagine ULA or Arianespace hiring a water tower company to build the body of a rocket outdoors? I agree this whole thing is mind blowing. The orbital prototype is a test craft so it isn't quite as critical. They may build a building for the production rockets. But then again ocean going ships are built out in the open. The future of spaceflight is a move away from precious, expensive one time use rockets to industrial workhorses made to take a beating from being used over and over again. You're right about the building, I'm sure they'll build something at either Boca Chica or Cape Canaveral once they get out of the prototype stage of things. To your second point, I agree and can't wait to see the rocket industry transform over the next few years and decades. It feels like this is all happening so quickly, but I guess they’ve been working on the Raptor engine for years. The craziest thing to me is the scale of that thing. Note the size of the tractor trailers which are closer to the camera than the test ship. Please forgive my ignorance, but when they say "hop", I assume that's not something along the lines of say, a Battlestar Galactica "jump"? Sadly, no (if I understand your Battlestar Galactica reference correctly). What they mean is a suborbital flight of the craft to test various systems for the orbital version of the craft. The first couple of videos on this SpaceX YouTube playlist give a pretty good idea of what will be happening (they're from SpaceX's Grasshopper vehicle, built to test Falcon 9 reusability concepts). I didn't think so, unless there had been a giant leap in tech that I wasn't aware of! Ah, that pesky speed of light and all :/ As it is, I'm confident I'll live to see us explore this solar system, at least, and thats good enough for me. As it is, I'm confident I'll live to see us explore this solar system, at least, and thats good enough for me. That would be like waking up from a 200 years coma. PS: i started watching Battlestar Galactica this month. Awesome show. That would be like waking up from a 200 years coma. PS: i started watching Battlestar Galactica this month. Awesome show.